Order Captain Kombucha Raspberry from the Online Health Food Store UK. 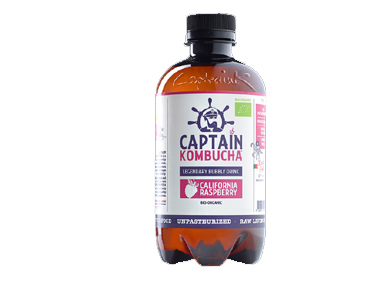 Buy Captain Kombucha California Raspberry - 400ml and other quality Juices & Soft Drinks safely online in the UK. Captain Kombucha is a delicious naturally bubbly drink, handcrafted to perfectionin Portugal. Every bottle is made and fermented with their own kombucha culture and only certified organic ingredients. Our UK Health Shop sells real Captain Kombucha and other Juices & Soft Drinks from top-quality brands safely online to customers throughout the United Kingdom in England, Wales, Scotland and Northern-Ireland. View more products on the Online Health Food Store from Captain Kombucha. Where to buy Captain Kombucha Raspberry safely online? Shop at the Online Health Food Store if you are wondering where you can buy Captain Kombucha California Raspberry - 400ml safely online in the United Kingdom. Captain Kombucha Raspberry - Captain Kombucha California Raspberry - 400ml in Juices & Soft Drinks and Drinks.